This appeared as “Idea to retire: A closed-platform Internet of Things” on the Brookings Institution’s TechTank blog. The Internet has gone through a major demographic transition: in the year 2015, the number of devices connected by the Internet surpassed the number of people connected by the Internet. Public policy makers need to move past the idea that the Internet is something that we experience through a browser, using our mobile phones and personal computers. The Internet of Things (IoT) is here. Vast amounts of bandwidth are now used by devices communicating about their status and our behavior. Experts estimate that there will be over 60 billion devices in the IoT by 2020. That means almost a million new devices are being connected to the Internet each hour—and that the time to craft public policy is now. These device networks will have an impact on our lives both as citizens and consumers. Recently, the global car manufacture Volkswagen was caught designing software for cheating on Federal pollution tests. In this case, the cars were programmed to deceive the emission testing equipment, a large dynamometer or “rolling road” that measures pollutants as the car drives on a large treadmill-type platform. The scandal has caused immense damage to VW’s global brand. This is not simply about misleading consumers, but about undermining civic virtue as well. There are good reasons for pollution regulation—we need government to help us achieve a civic goal of polluting less. People who bought VW cars were misled as consumers, but drivers of those cars are implicated as bad citizens—and VW as a bad corporate citizen—for contributing to more photochemical smog in our cities. The Internet of things has already become a network that we as individuals have little awareness of or control over. The basis of a democracy is voluntary civic engagement: participation in setting government policy is intentional and a matter of personal choice. In democracies, citizens express their preference through activism and voting. Historically, governments and politicians eager to do a good job interpreting citizen intent also relied on opinion polls, conversations with civic groups, social science research, and huge record-keeping projects like the census. Politicians have long tried to interpret citizen intent and manipulate it through rhetoric and campaigning. Public policy makers need to work to keep the Internet of things open and inter-operable, and to make it a public information infrastructure. As individuals, we need to keep track of where our data ends up. Even at this early stage, it would be difficult to make a list of all the third-party vendors, market analysts and government agencies that have data we have generated. Down the road, we may have little choice on where our data ends up. Standards to determine access to data are now being set behind closed doors, defined by industry engineers arguing for secrecy and proprietary systems. If these arguments succeed, the next Internet will be even more personally intrusive, publicly unaccountable and susceptible to manipulation than the current one. To prevent that, a basic step would be to require that any connected device be able to divulge a list of the “ultimate beneficiaries” who benefit from its sensor data. Terms of service always get modified, ownership structures change over time and the number of third parties paying for access to our data only gets longer over time. But if the smart light bulb you buy is able to relay some data up the network to other organizations, it should be able to pull down a list of the corporate, government and civic entities using your data. The next step would be to require that whenever we expect a manufacturer to comply with public policy, the software code runs the device being inspected is open and public so that government agencies and public interest groups can help ensure public safety. After that, we need to make sure the Internet of Things is built for civic engagement, not simply government policy making and industry marketing. These days, it’s normal for civil-society groups to have an Internet strategy or a social-media strategy. It’s not too soon for them to consider their IoT strategy. The next Internet is still far enough away that citizens can have a voice in how it is constructed and operated. 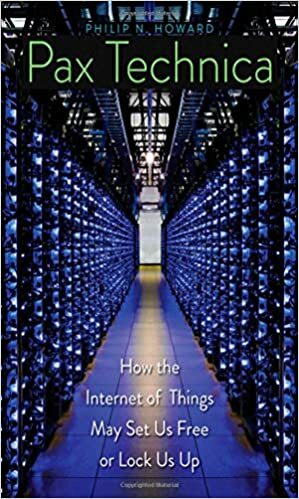 To shape the next Internet responsibly and wisely, citizens will have to understand what the IoT truly will be—an information infrastructure for public life and civic virtue. And there are several things we can do now to build political participation into IoT. With billions of sensors to learn from, there’s no reason governments shouldn’t use them to make better public policy. And firms should be allowed to do in-depth market research on the behavior of their customers and use smart devices to run their business efficiently. It’s very likely that citizens and consumers will benefit from IoT innovations, but policy makers have to let go of the idea that the Internet is made up of cellphones and laptops. First and foremost, they must provide ways to ensure that people are presented with choices about who gets to use their individual data for politics. And they have to treat device networks as common carriers for the public good. The devices that are being connected to the IoT aren’t smart because they obey us as consumers and citizens. They are smart in that they obey the device manufacturers. Policy makers need to realize that for the Internet of Things to work well, and in support of our civic and political values, we all need to be able to see what’s under the hood.